Looking for a quick snack while having a movie night or throwing a party? Popcorn is a fan favorite! 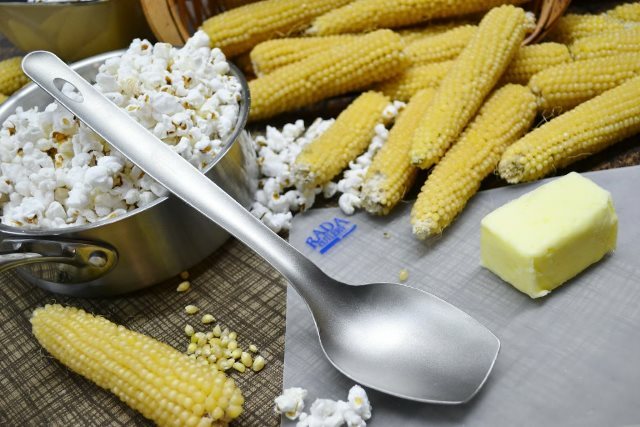 Making your own popcorn is just as easy as microwave popcorn. It is also healthier than microwave popcorn and you can make as much or as little as you’d like. Let’s Have a “Pop” At It! Place a medium sauce pan with a lid on the stove top on medium-high heat. Add the oil to the center of the pan and let it heat up. Pour the popcorn into the oil and shake around to evenly coat the kernels. Make sure there is only one layer of popcorn kernels on the bottom of the pan. Once the kernels start popping, place the lid on the pan. Shake the pan during the popping to let unpopped kernels reach the oil. Once the popping slows down, take off the heat and pour into a large bowl. Add butter and salt to taste and include any other mixin’s your friends and family may enjoy! 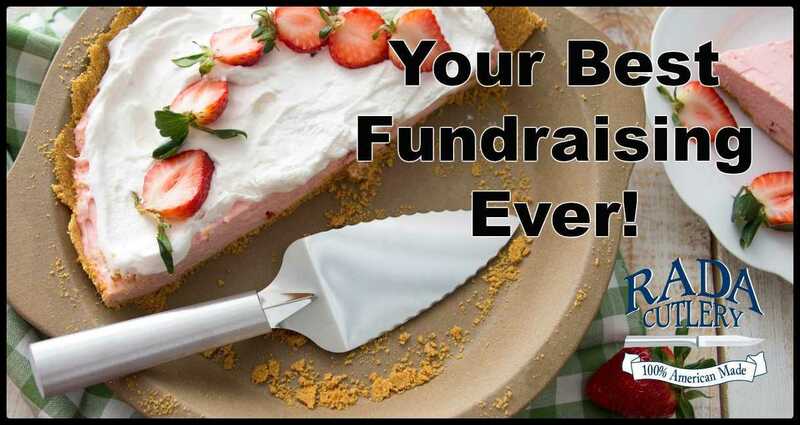 Rada Cutlery is the best fundraising partner for any nonprofit group! Every year, tens of thousands of groups partner with Rada to raise money for noble causes. Churches, clubs, schools, sports teams, civic organizations, and more make the money they need through a Rada fundraiser. Rada fundraisers offer high profits, fantastic products, and unbeatable customer service! Click here or on the catalog photo below to check out our fundraising catalog! Did you know that besides offering fundraising opportunities for non-profit organizations all over, Rada Mfg. Co. also provides opportunities for independent selling? Independent Selling allows you or your small business to sell Rada Cutlery the way you want to. There are no contracts or long-term commitments to working with Rada Cutlery. You also have a multitude of choices in what and how you want to sell! Check out our website to learn more. Still Have Questions on Stove Top Popping? 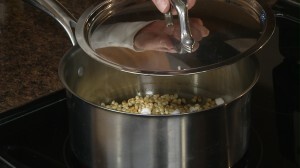 Check out Kristy’s video on how to make stove top popcorn. Hi this is Kristy in the Rada Kitchen. 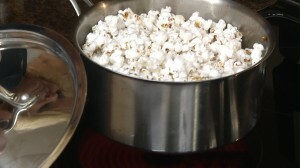 And I wanted to share with you how to make good old fashioned popcorn in a pan on your stove. It tastes betters, it’s cheaper and it’s more healthy than microwave popcorn. And it tastes a lot better than air popped popcorn. All you need is some oil of any kind. 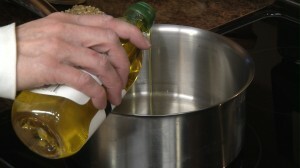 It can be olive oil, vegetable oil, canola oil but all you need is oil in the center of your pan. And I like to heat that up a little bit before I put in my popcorn. I do grow my own popcorn. A lot of people are surprised when I tell them I grow popcorn in my garden. Anywhere you can grow corn you can grow popcorn. Only thing is you have to buy the seed, I can’t find it in local stores. So I do order it through the mail and from a catalog. It’s really easy to grow and you get quite a variety of ears. I think it depends on where in your field it’s planted. The end rows don’t get quite as big of ear. It’s really fun you just let it grow all summer and pick it in the fall. Let it dry and you can usually eat it around Christmastime. I have my oil getting hot, probably medium or medium high and I just kind of just swivel it around in the bottom of the pan. Then I’m going to add enough popcorn just to cover the bottom. You don’t want to layer it on top because you want it all to evenly heat. Make sure you have a pan that has a lid because it is going to pop. Now you just have to wait for the oil to get hot enough to pop the corn. Now you can start to hear the oil sizzle. You want to get your lid ready because once it starts popping an you want to shake it every once in a while so it doesn’t burn it. So have your lid ready. I don’t like to put the lid on tight because it seems that it moisture makes the popcorn tough. So I let the steam escape. Then I do reduce the heat just a little bit. And then I usually let it sit, after a little while, you can take the lid of because it gets dense enough where they won’t pop out. And there you have fresh, natural popcorn. Put a little salt and butter on it and it’s a good, wholesome family treat.